Instantly removes bad taste or smells from boat or RV’s potable water. Ideal for use after seasonal storage to “freshen” water tanks. Removes chlorine, sulphur, plastic or metal odor and taste. Provides long-lasting effect, even in extreme temperatures. 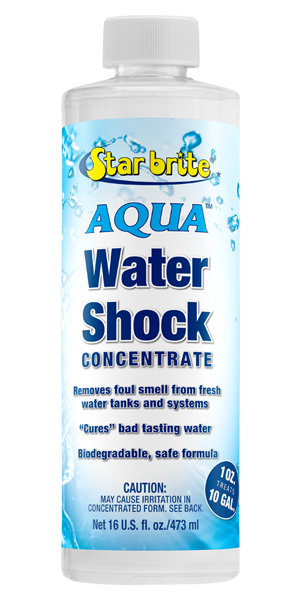 NOTE: To maintain water quality year-round, use Star brite Aqua Water Treatment & Freshener. Add 1 fluid ounce of Water Shock for every 10 gallons of potable water to be treated. Use as often as needed. Note: Water Shock is in concentrated form and must be diluted prior to drinking treated water. Do not drink or ingest at full strength; safe to drink only when diluted according to directions. After water tank and waterlines have been treated, use AQUA Water Treatment & Freshener to maintain water taste and smell on an ongoing basis. Note: If boat or RV has been in long-term or seasonal storage, or if water has strong taste or odor, use AQUA Water Tank & System Flush to clean and deodorize.